Amazon.com description: Product Description: The target of Â SQL tuning is Â the improvement of the existing execution plan.Â The authors discuss the removal of brakes in the execution plan. Such "brakes" or bottlenecks can be recognized by a formal analysis of the execution plan. For this purpose no data model knowledge is needed. This is especially beneficial for database administrators because they are usually not or insufficiently Â familiar with the data model. The book presents numerous practical examples with this method. 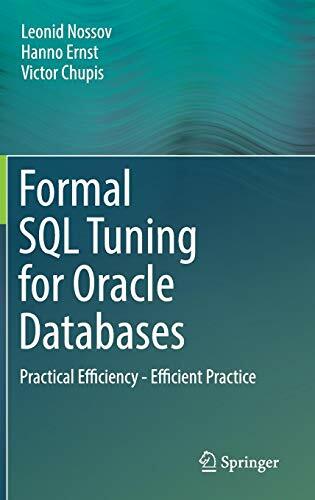 With Hanno Ernst, Leonid Nossov | from Springer-Verlag New York Inc (November 8, 2016); titled "Formales Sql-tuning FÃ¼r Oracle-datenbanken: Practical Efficiency - Efficient Practice"
About: The target of SQL tuning is the improvement of the existing execution plan.